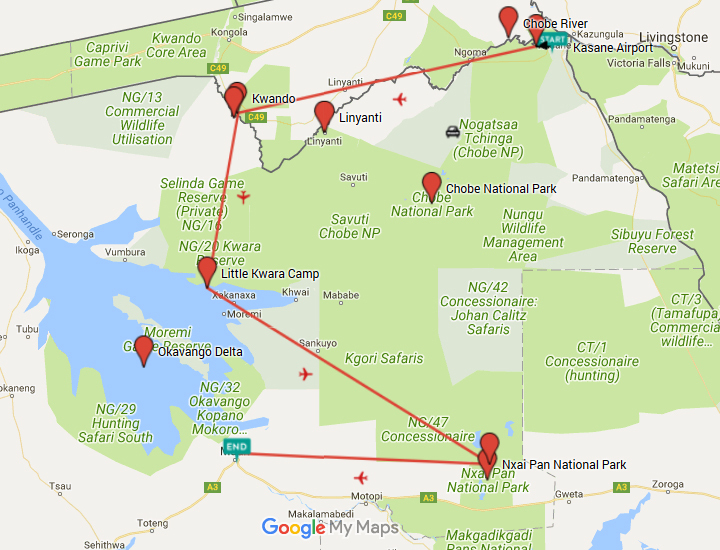 More info:Price includes full board accommodation, selected domestic flights, all transfers and game viewing activities. Price does not include international flights but these can be arranged as part of your package. On this and every tour to Botswana we place significant importance on ensuring that the wildlife and environment of this spectacular country is conserved and supported. Botswana is steadily becoming one of the world's leading ecotourism destinations and we strive to do all we can to help this to continue. One of the ways in which we can do this is to ensure that all travelers have been fully briefed in regards to traveling in an environmentally responsible way. Your pre-departure information for this trip will include advice on how you can reduce your carbon footprint, including advice on responsible use of water, a most precious commodity throughout the areas we will visit, and appropriate waste disposal. We also ensure that all of the lodges and accommodations we use on this trip have appropriate “green” credentials and have policies in place for environmentally friendly operations. For example the owners of the Chobe Game Lodge, which will be your first stop on this exciting tour, have worked tirelessly over the last 2 decades to transform the lodge into an eco-tourism property, culminating in it being awarded the highest Ecotourism Level recognised in Botswana. Groundbreaking eco-tourism practices are in place here including the use of Africa’s first ever CO2 emission free silent electric fleet of 4X4 game-viewers & safari boats. They also boast the most advanced biogas plant of any lodge in Botswana, where over 100 kg of biodegradable waste is processed each day. Likewise, the eco-friendly credentials of Little Kwara, Lagoon Camp and Nxai Pan Camp are also impeccable, with comprehensive use of eco friendly power, hot water generation and waste water treatment, and extensive policies in place for minimising the footprint of your wildlife experience. One of the most important and exciting elements of your trip to Botswana will be the numerous wildlife encounters that you can expect to experience. From big cats and numerous predators, to massive herds of elephants you will be witnessing these remarkable animals in their natural habitats and we place a huge importance on ensuring that these fascinating and beautiful creatures and their homes are protected. All of the game viewing activities you will be participating in are operated by local companies who are passionate about ensuring the ongoing survival of the country’s unique wildlife, and we are firm believers in the concept of opening up the eyes of people across the world to the ongoing fight to conserve the habitats of the country’s wildlife, which in turn will help to garner even greater support for the charities and initiatives in place. We actively encourage investment in these schemes in our pre-departure information and our locally based ground handlers recommend appropriate ways in which you can help the people of Botswana to preserve the elements that make this country so unique. We support many wildlife organisations worldwide and further to this the ground handlers that we use for this trip are 100% committed to ensuring the ongoing protection of wildlife by supporting charities such as the Maun Animal Welfare Society which provides free veterinary treatment to low income individuals in Northern Botswana. In turn this vital service assists in preventing the spread of disease from domestic animals to the world famous Botswana wildlife population. We are committed to ensuring that on all of our tours we only use lodges and hotels that have a proven track record of treating staff well and fairly. This is evident in all of the accommodations we use, where staff are happy and well cared for, including the Chobe Game Lodge where they have fantastic community support initiatives and staff wellness programmes. The lodge has a share profit scheme where each member of staff receives a share dividend at the end of every financial year, a youth trainee development programme, and are passionate about promoting the empowerment of women, with over 65% of the work force being female and boasting the only all-female guiding team in Africa. Little Kwara, Lagoon Camp and Nxai Pan Camp are 100% citizen-owned and pride themselves on creating long-term careers, and not just temporary jobs, for their fully local work force. Solely using local agencies and providers means we have up to date local information and can therefore provide the most relevant information in our pre-departure literature. This includes information on on-going initiatives and community efforts that we actively encourage our customers to become involved in, including schemes to provide school children with equipment, information on cultural etiquette and advice on how to engage with and help the local communities. We offer first-hand advice on creating meaningful and respectful relationships between tourists and residents and suggest local areas and communities to visit gaining cultural insights along the way, along with advice on where to buy souvenirs (to ensure the proceeds are going directly to the vendors), where to eat & where to drink.